A First Order Technician, also referred to as a First Order Crew, is a Star Wars minifigure released in 2016. The First Order Technician minifigure has a plain black leg piece, with a black torso that has dark grey printing on the front and back of the piece. This printing is used for outlining a First Order tunic. The Technician's head piece is Reddish Brown, with black printing for eyebrows (the left eyebrow is raised), two dot eyes with white pupils, a black downturned mouth, and a Dark Brown line under the mouth for detailing the chin. 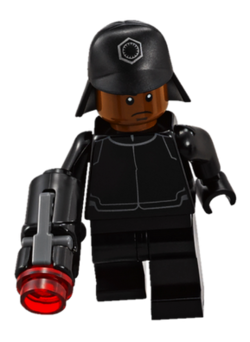 This minifigure comes with two accessories- a black stud shooter with a dark grey firing pin and transparent red studs and a black hat with a new mould that has the First Order logo printed in dark grey on the front. First Order technicians served the First Order by supporting the operations of the First Order military. ↑ The top of the box art on 75132 First Order Battle Pack lists this minifigure as a "First Order Crew". Facts about "First Order Technician"
This page was last edited on 14 July 2016, at 12:16.